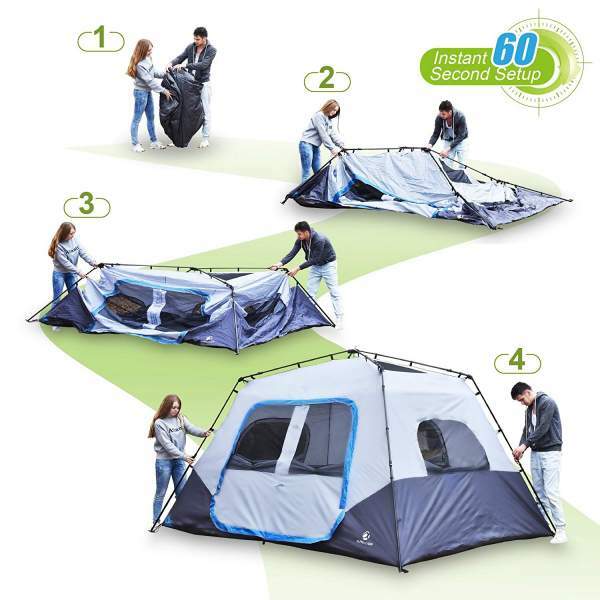 ALPHA CAMP 8 Person Instant Cabin Tent is a tall summer camping tent with a steel frame, partial coverage fly, 60 seconds setup, many windows, and a great price. ALPHA CAMP 8 Person Instant Cabin Tent. Instant setup under 60 seconds. Obviously, the most important feature of this tent is its instant setup. This means that the frame is preattached to the tent and you simply unfold the tent and extend its legs and it is ready within one minute. One person can easily set this tent up. The procedure is presented in the pictures below. This is also a cabin style tent with straight walls and with windows on the three sides, and the whole structure is freestanding. There are no dividers inside so you have a single room design with 12 x 9 feet (366 x 274 cm) dimensions. This is a 60-seconds setup construction. Capacity-wise, they describe it as a “spacious” tent that can accommodate 8 people. But the floor area is only 108 ft² (10 m²) and this means 1.25 m² per person, so for a real camping this makes no much sense. There are no external storage areas and you have to keep everything inside. So realistically, this is a tent for maximum 3 – 4 people, good enough for parents with one or two small kids. The tent can accommodate two queen size mattresses and you would have some space around because its dimensions are 12 x 9 ft (366 x 274 cm). You can compare this with the dimensions of this Coleman Queen Size Air Bed. But this is not the best option, you can save the floor area by using bunk cots instead. Seasons-wise, this is a pleasant summer camping tent with lots of mesh on the windows and on the door and with the partial coverage fly so this is for mild weather conditions without much rain. The structure is very tall, 76 inches (193 cm), so I would not expose it to strong winds. Such a fly is not the best design for windy conditions. Climate-wise, the tent is quite enclosed for such a type so there is no much mesh on the ceiling, there are only a couple of triangular sections with mesh which you cannot close. But the mesh on the windows and on the doors is together with panels and you can regulate the airflow and cold drafts. So although it is far better for a cooler environment than most of the cabin style tents of such a type, there are better options. If you need such a tent, better check these cold weather camping tents. Note also that the fly is partial coverage type so although its waterproof rating is high (more below), there are many zippers on the windows which are not under the fly, and I would not use it in the areas with lots of rain combined with side winds. For such an environment better check these Eurohike Buckingham Elite 8 tent or Vango Odyssey Air 800 tent; both are with PVC windows and you will be surprised to see how big areas those 8-person tents provide. Weight-wise, the weight of this tent is quite reasonable; with its 20.5 lb (9.3 kg) it stands well when compared with some other similar tents from this size range, you will see this in the comparison table below. They do not provide any information about the tent walls materials except that this is a polyester. No mentioning about its waterproof rating, so this is disappointing, to say the least. The fly is with 2500 mm waterproof rating and this is certainly more than enough. The floor is a sort of plastic with welding and inverted seams. The frame is steel so this is durable enough for such a construction, but you should not use it in areas where you might expect snow. Have seen people asking about this, in my view, this structure is not designed to support such a vertical pressure. There are three separate windows plus two on the doors, all double layer construction so you can regulate air flow as long as the weather is fine. On the front, you have a double door construction, and they both roll to the central section where you can fix them with toggles. They write about excellent ventilation and this is true as long as the sky is clear. But if it is raining you have to close the doors and the windows. Though the two side windows are partly protected by their brims and you can keep the upper sections open for air flow. There are two mesh sections under the fly and this should generate enough air circulation. But there are no floor vents here, so this is not the best design for rainy and warm situations when you have to keep the tent closed. The tent comes with an electric cable port on the front. There are two organizer pockets on the walls. This is far from enough for such a big tent and with so flat walls, pity. The package includes: the tent with the preattached frame, the rain fly, 15 tent stakes, 6 guylines, and a 210D oxford PU waterproof carry bag. Express setup under one minute. Only for mild weather conditions. Dimensions: 12 x 9 ft (366 x 274 cm). Area: 108 ft² (10 m²). Packed size: 45 x 10 in (115 x 25 cm). It might be useful to see how this tent compares with some other models from well-known brands built in the similar style, so I give two of them, both with the same declared capacity. Obviously, all are too small for the declared capacity (as usual), but the ALPHA Camp tent is the smallest. Its packed size does not look great, but this is typical for instant tent, the other two tents are without this feature. Please follow the links in the table for more details. The ALPHA CAMP 8 Person Instant Cabin Tent looks cool and the setup cannot be easier, but I would not put it to harsh tests. This is a tool for summer camping in mild weather conditions. So if you need something for occasional use and do not want to spend much, this is a tent to consider, the price is more than fair. If you need something bigger, then check their 10-12 person tent. If you want something different for 8 people, please check this long list of 8-person camping tents, all are described in detail in this site. For example, check this Eureka Tetragon HD 8 Tent which is a very simple dome style structure, or this Slumberjack Overland 8 Person Tent if you want something in the tunnel-style. For all other sizes just look around and in the categories, but check also this long list of instant tents. Thank you for reading. Do you have any experience with this tent? If so please share it here, there is a comment box below. Have a nice day.